The weather improved for the better after Sunday. It was wall-to-wall sunshine for the rest of the camp. 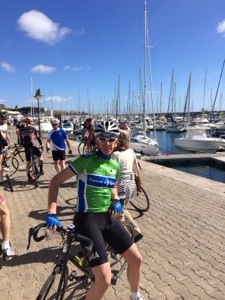 Our rest day was an easy spin down to the Marina for coffee & cake, then back to the villa. I spent the rest of the day lying by the pool, stretching & snoozing. Lovely. The first day of our second block would see us doing the climb of Tabayesco again, followed by 2 x 15 minute threshold intervals. I was a little worried about how my body would cope after being so tired on Sunday, but it seemed like the rest day had done it’s job and I was never in difficulty. I’d go as far as to say that it was one of the best days I’ve ever had on the bike! Day two was all about tempo work. We road the hour or so to the circuit, up to Femes & down to Playa Blanco, then we were split into our groups for 2 x 50 minute efforts. Riding in a chaingang, taking 30-60 seconds each on the front, this was another exhilarating and exhausting session. I loved it, even though I was hanging on in the second interval when our group was down to three riders. I dug deep & made sure we finished together. 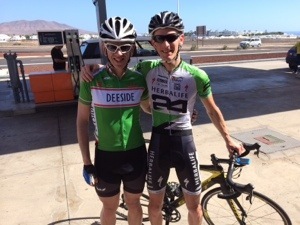 After that it was a loop through the lava fields to El Golfo and back to the brutal climb of Femes. That would be our last hard effort of the camp, then we rode back down to Puerto for coffee. We flew home last night and now it’s all about rest & recovery and letting the training soak in. I’m really excited and motivated for the season ahead!